Extreame Savings Item! Save 43% on the ANTAOLE Lightning Cable, Nylon Braided Charging Cord 2 Pack 6ft Data Sync iPhone Charger Foldable Dual Port Charger Compatible iPhone/iPad/iPod by ANTAOLE at Got Busted Mobile. MPN: anw1c2. Hurry! Limited time offer. Offer valid only while supplies last. ANTAOLE 2-Port International USB Wall Charger -Smart Design -Full-Speed Charging -Certified Safe Specifications: -Input: AC 100~240V 50/60Hz(U.S.
ANTAOLE USB charger with smart technology will adjust the current output to match the specific needs of the devices plugged in, providing for each one the best full speed charge sustainable without risking to damage your expensive gadgets: smart and ultra fast, different from any other charger you have ever owned before. Foldable Plug travel adapters to easily fit into an All-in-One travel plug, it is the best USB travel charger for business trips or travelling as it also covers the voltage100v-240v. Suitable for international travelling. 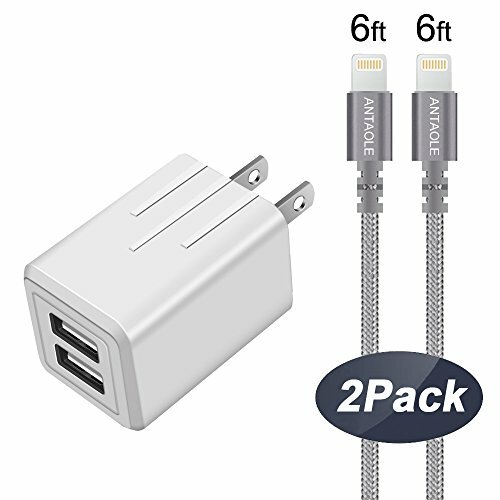 What You Get:1 x 2-port USB Wall Charger + 2 x 6FT Lightning cable. If you have any questions about this product by ANTAOLE, contact us by completing and submitting the form below. If you are looking for a specif part number, please include it with your message.